Pretty much any randomly picked ecommerce-related application has got its pros and cons, which is basically a tolerable thing as long as computer users’ fundamental rights and preferences are respected. The developers of some of these apps, however, cross the line in their attempts to get the bang for their buck, like in the case of Jollywallet. On the face of it, this solution appears to be useful, intuitive and non-intrusive. The vendor claims to provide the cash back feature for a variety of product purchase transactions, in particular when the user buys from their partnering organizations. This service is available directly from the web browser on the Mac box, where the widget sits in the upper part of web pages and contains basic account data and statuses of the money returns. That’s merely theory, though. 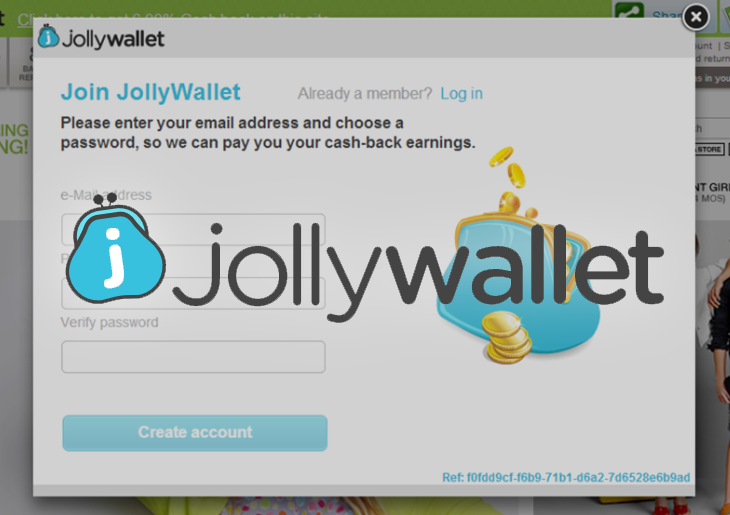 In practice, Jollywallet isn’t quite so friendly. What Mac users encounter while using this tool is every visited web page being inundated with advertisements. That’s in addition to the somewhat large console of the app proper. Sites are displayed in kind of a crooked way, with banners and comparison shopping extras filling up the space that would otherwise present the original text, images or videos. What further spoils the victim’s Internet browsing experience is the intestinal ads, that is, pages that open up in the background when any part of the website is clicked on. That’s a big nuisance, but there’s more. The so-called in-text links will start getting automatically generated for more or less targeted keywords on pages. These double-underlined phrases will produce pop-ups whenever the mouse cursor hovers over them. As a result, Jollywallet turns your browser use into a nightmare within literally the first hour or two that it’s running on your Mac. There are some more concerns regarding this add-on. It obviously has access to some of its customers’ previous purchases and the respective financial footprint, so it’s within the realms of possibility that this information could be of interest to third parties. Not that we are saying that the data is handed over to someone else, but at the end of the day anything may happen. And yet, the main issue about Jollywallet at this point is that it, to some extent, quenches its commercial thirst at the expense of the customer’s peace of mind. Since it is adware, therefore, it should be removed from the Mac out of harm’s way. When confronted with malicious code like the Jollywallet on Mac, you can neutralize its toxic impact by leveraging a specially crafted system utility. The Freshmac application (read review) is a perfect match for this purpose as it delivers essential security features along with must-have modules for Mac optimization. This tool cleans unneeded applications and persistent malware in one click. It also protects your privacy by eliminating tracking cookies, frees up disk space, and manages startup apps to decrease boot time. On top of that, it boasts 24/7 tech support. The following steps will walk you through automatic removal of the Jollywallet infection. 4. Check whether the Jollywallet virus has been fixed. If the lock screen is still there, go to the Uninstaller option on Freshmac GUI. Locate an entry that appears suspicious, select it and click Fix Safely button to force-uninstall the unwanted application. 5. Go to Temp and Startup Apps panes on the interface and have all redundant or suspicious items eliminated as well. The Jollywallet fraud shouldn’t be causing any further trouble.